Organizational charts become a necessity when you work with a large group—people need to understand where they fit in the organization and what tasks they need to accomplish, and a visual representation brings the point across quickly. 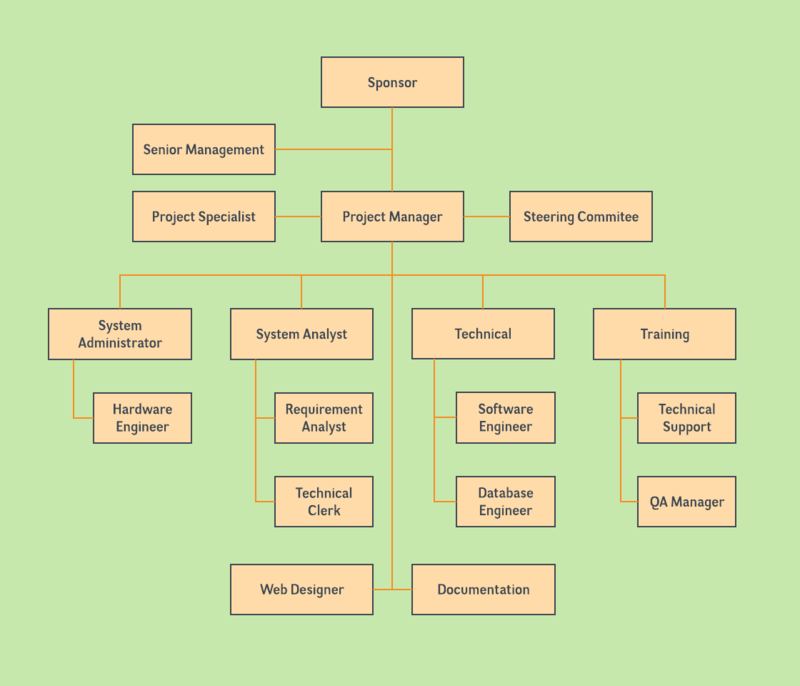 However, org charts can also become a hassle. It takes a lot of time to collect the information you need, let alone structure it in a way that looks professional, and if your organization grows or changes at the drop of a hat, you have to check your org chart frequently for accuracy. At Lucidchart, we want you to benefit from visual communication without any of the drawbacks. 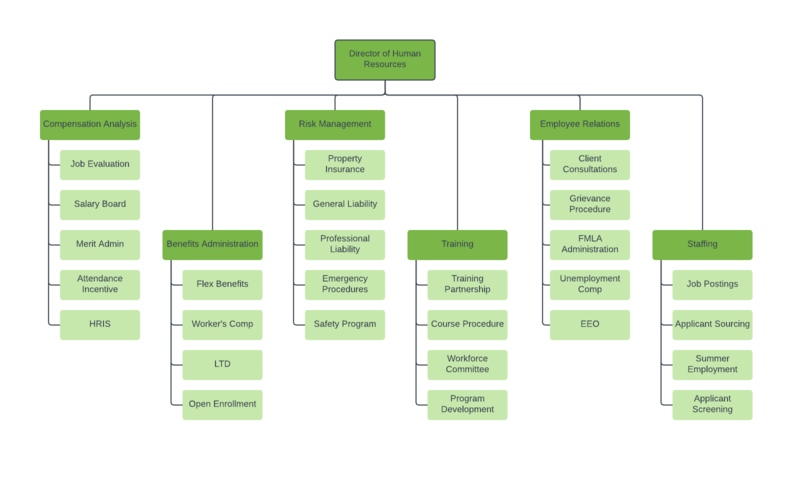 In this guide, you’ll find org chart templates for a variety of organizations and scenarios. Whether you run a restaurant or lead a religious congregation, Lucidchart helps you delineate responsibilities and keep your group in order. On average, Lucidchart increases transparency within organizations by 43%. Sometimes you just need to start from scratch. 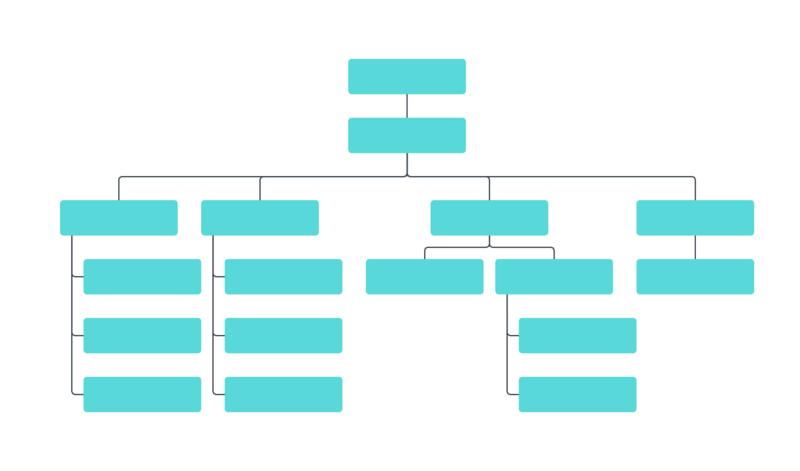 With our blank org chart template, you can customize your visual to fit your group better. Just click any box, and a dialog will appear where you can enter names, titles, phone numbers, and other information you may need. 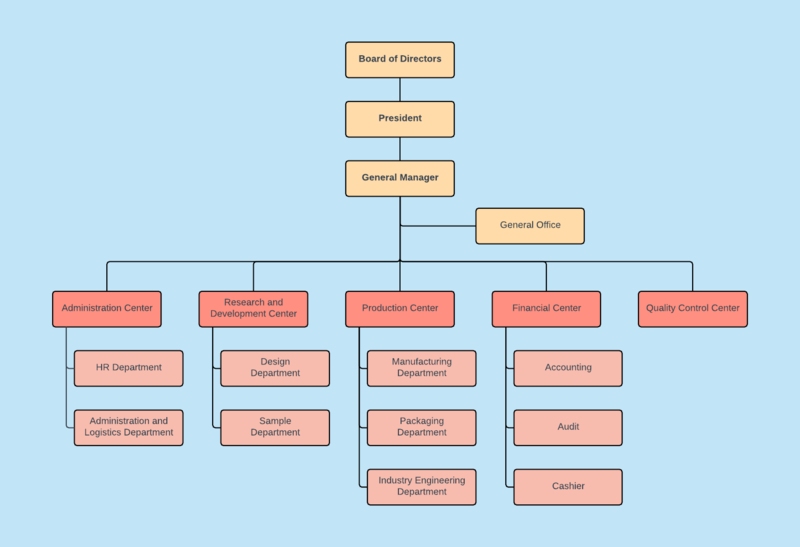 The hierarchical org chart template connects employees to their supervisors, starting with one individual at the top, typically the CEO or another leadership position. Depending on who reports to whom, you’ll likely break this org chart down by department. To learn more about the main three types of organizational charts, read this article. The traditional org chart structure doesn’t work for every company, particularly when teams in different departments need to work together. Structured like a grid, the matrix org chart shows teams and reporting relationships that form for special projects. If you run a startup or if you don’t have many levels between executives and entry-level employees, you may want to try this flat org chart template. This type of org chart (and the business mentality that accompanies it) encourages more open communication. When employees at your company have questions about open enrollment or the company’s referral program, they may know to turn to Human Resources, but they don’t always know the right individual to talk to. This HR org chart templates clears up the confusion—it show employees who to contact and what resources are available. In Lucidchart, you can even pull contact information straight from BambooHR to create your diagram. Effective communication is essential if you want your business to succeed. When you show employees the way teams have been organized using this company org chart template, they can better understand their responsibilities and know to whom they should turn when they have questions or want to collaborate. Lucidchart makes organizational charts easy to maintain, even when you restructure. As scrumptious as your menu items may be, you’re unlikely to earn 5-star reviews if your diners have an unpleasant experience at your restaurant. 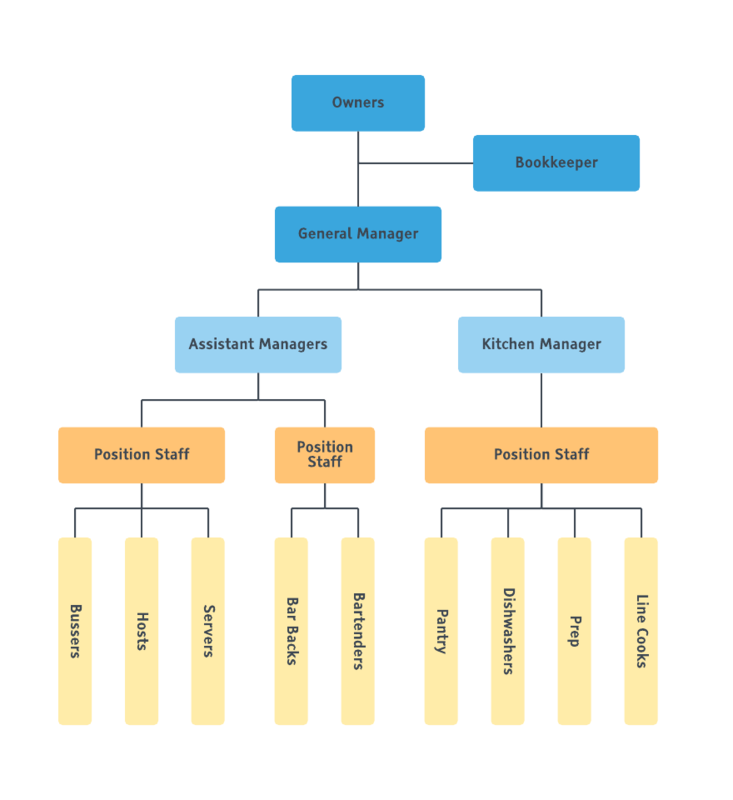 Use this restaurant org chart template to keep track of roles within the restaurant staff, improve communication, and make your dining experience Zagat-worthy. When you start a business partnership, organizational charts can keep both sides aware of their roles and responsibilities. Start with our partnership org chart template, and then use the sharing options in Lucidchart to send this information to your partner company. If they have access to your Lucidchart document, they can even leave comments to clear up misunderstandings. Whether you have just restructured your business or hired a large group of new employees, you can use an organizational chart to make sure every employee understands how he or she fits into the larger picture. Customize our business org chart template and store it in Confluence, Google Drive, or another integrated platform. Sometimes organizations create teams for a specific project. Even if you have a chart that represents the entire organization, you might want to create a new document for this short-term team. Open our project org chart template, and you can help each team member understand the dynamic and get started on the project quickly. It takes a lot of people to create a fantastic experience for your hotel’s visitors, from the employee who manages the front desk to the one who whips up a filet mignon when a guest orders room service. 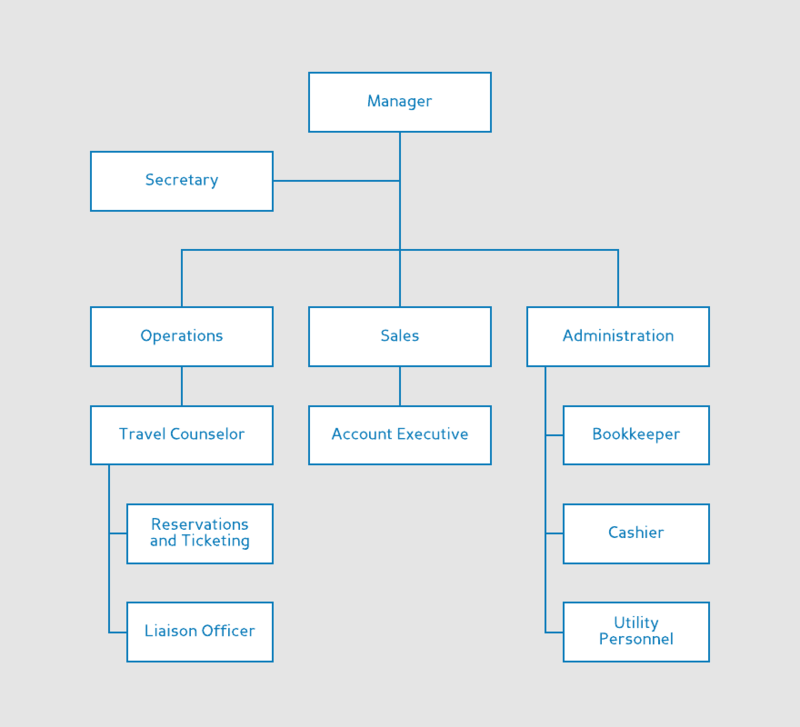 Keep track of these responsibilities and see where you may need more assistance with our hotel org chart template. Before your clients can depart on their vacations or business trips, each employee at your travel agency plays a role to ensure a positive travel experience. Whether they work with airlines and suggest accommodations or balance the books, show your employees how each of them contributes. Our travel agency org chart template is simple to adapt as your agency does. For centuries, factories have streamlined the production process for higher efficiency and lower costs. 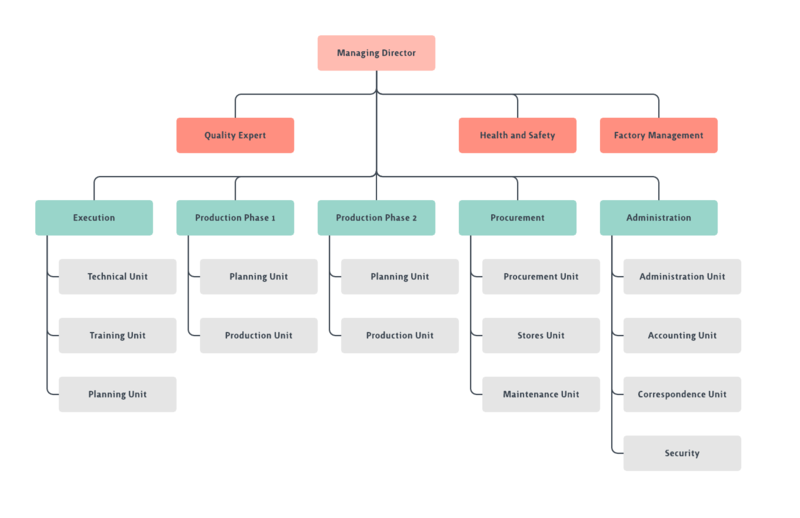 To ensure that your processes are as efficient as they can be, fill out our factory org chart template. You can easily see where you need more workers and where you can improve the process when you visualize your entire team in Lucidchart. 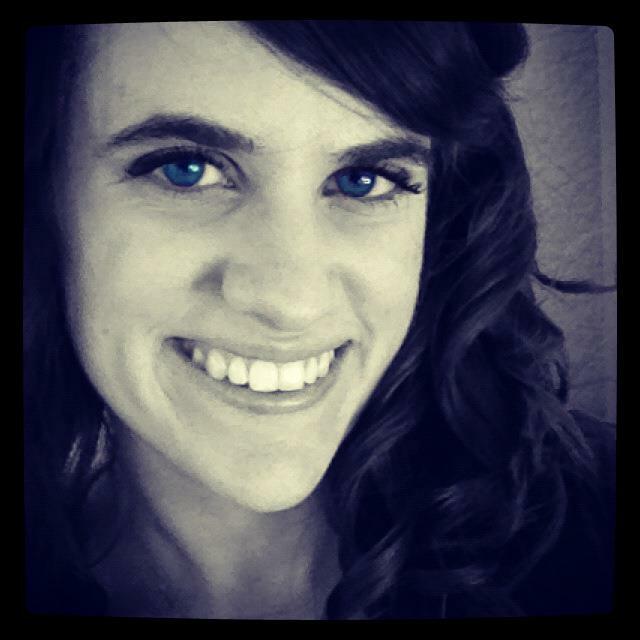 Don’t let event planning become too stressful. In Lucidchart, you can organize all of the people who will contribute to the big day with our event org chart template. Now you’ll know where to turn to make sure the venue looks beautiful, the food tastes wonderful, and any scheduled events happen without a hitch. Help others—both inside and outside of your congregation—understand how your church is organized. 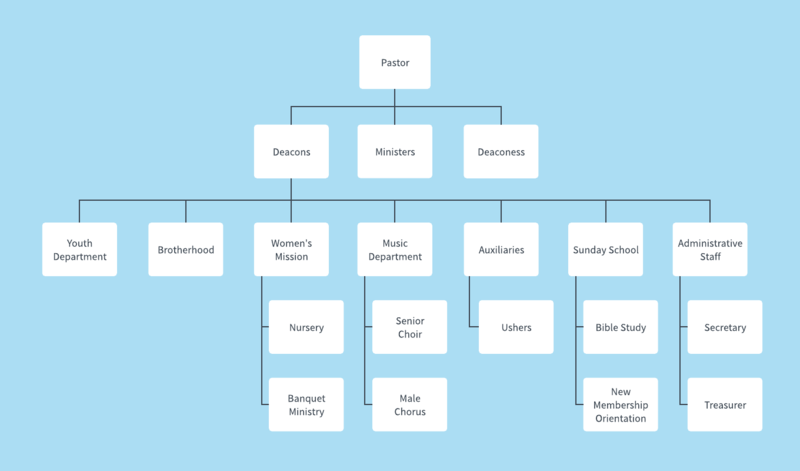 This church org chart template includes religious leaders, officers, members, and volunteers so everyone can fulfill his or her duties. Want to save even more time? When you sign up for Lucidchart, you can automatically generate organizational charts from data in a CSV file. Watch the video below to learn more. Now that you have created your org chart, how will you make sure fellow employees see and use it? If your company uses G Suite, you can add your org chart to Google Docs for easy access. Our Lucidchart add-on for Google Docs will even allow you to update inserted diagrams with just one click. Read our blog post to learn more, or download the add-on now. We hope these org charts increase efficiency and keep everyone on the same page, no matter how large or small your group. For even more templates, see our complete org chart template library.